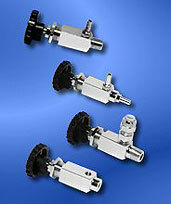 The 589 Series Needle Valve compact design promotes multiple configurations to fit the exact end use application. 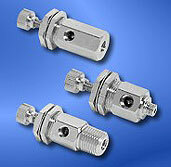 The 589 Needle Valve is rated to 500 psi and is available in an In-Line and Right-Angle version. The standard 589 Series Needle Valve has a Teflon® stem seal, Black Filled Polyester Knob, and a Brass Needle with 30 Degree Kel-F- Soft Tip for positive shut-off. The Stainless Needle, Yellow Knob and 5 Degree Kel-F® Tip are optional. 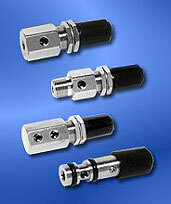 The panel mount requires a .563 hole and is supplied with one brass Hex nut.